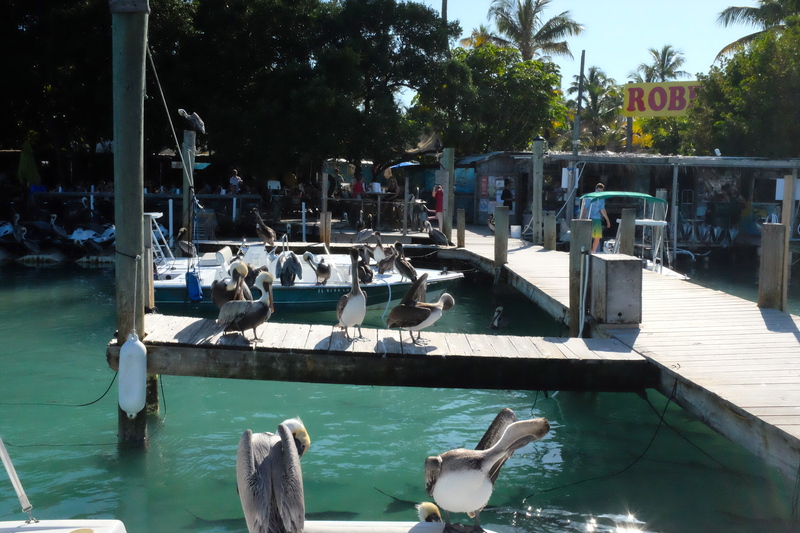 As luck would have it, when we were driving through the Florida Keys we stopped for a bathroom break at the cutest place ever – Robbie’s Marina. There’s a restaurant, little kiosks with homemade jewellery and dream catchers, and – obviously – a place to tether your watercraft of all sizes. Oh, and you can feed the tarpon for $5. 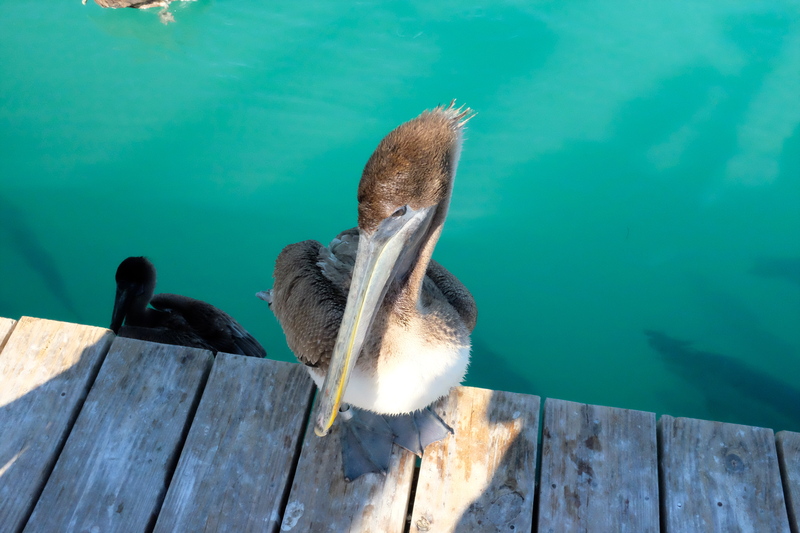 One man said the pelicans would rip the flesh clean off your finger bones if you let them, and I did see the gleaming hooks at the tips of their beaks. But another man cautiously scratched one on the head, noting that they were mostly harmless. I declined to attempt any feathered head rubs, but they did get pretty close. 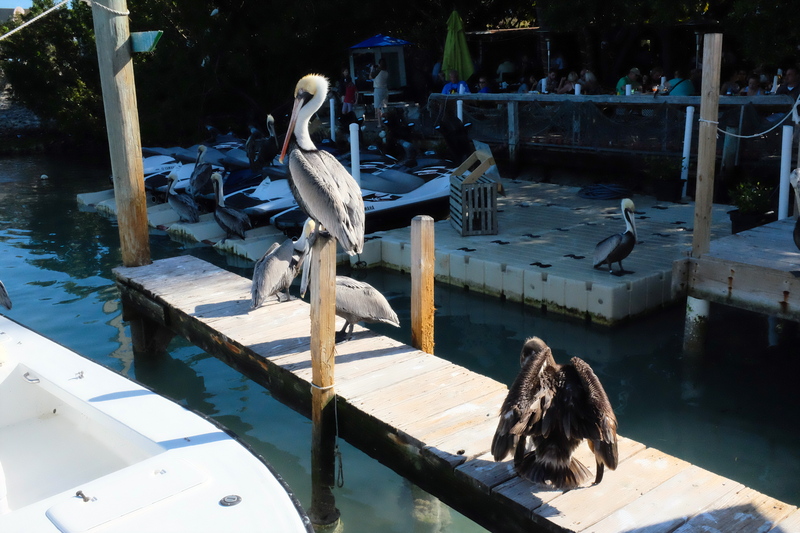 The pelicans waited patiently for lunch, bobbing silently in the green water or preening themselves on the marina posts. 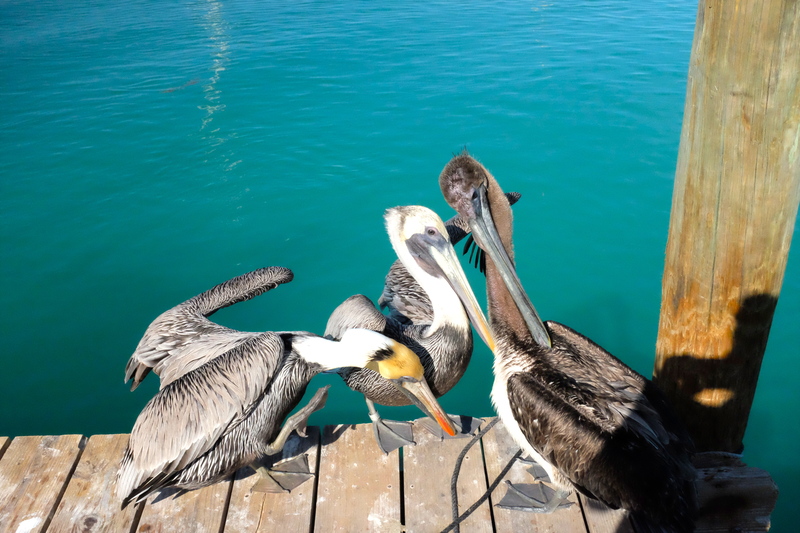 The tourists paid their $1 to get back to the docks, marvelling at the closeness of the birds, that illusion of almost-tameness that the promise of easy fish imposes on the scene. 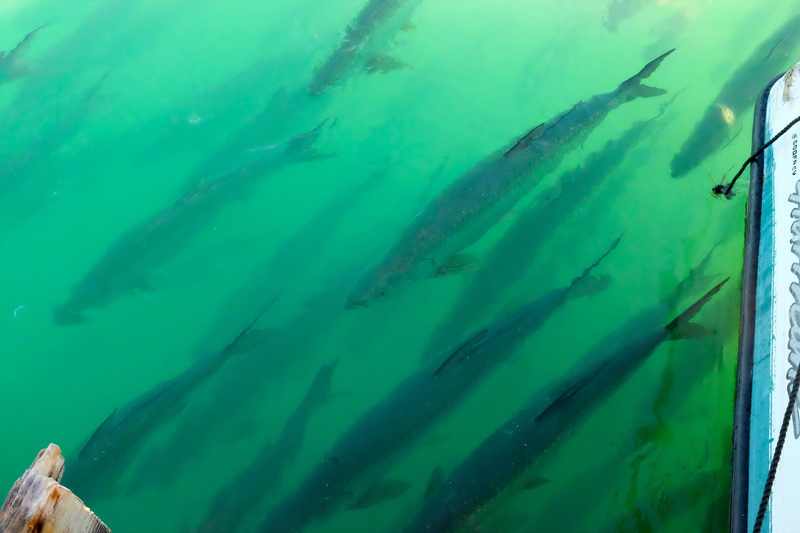 The tarpon were impressive for their size, their silky green-gold skin, and their silent, one-way group-gaze, but the pelicans were truly beautiful creatures. 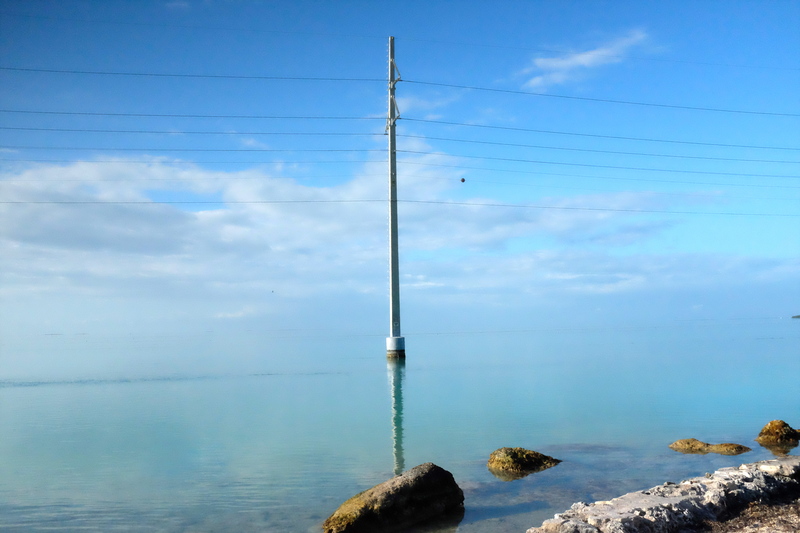 After the magic of Robbie’s Marina (never met the guy, but I applaud his gem of a spot by the side of the highway), we drove further through the Keys. 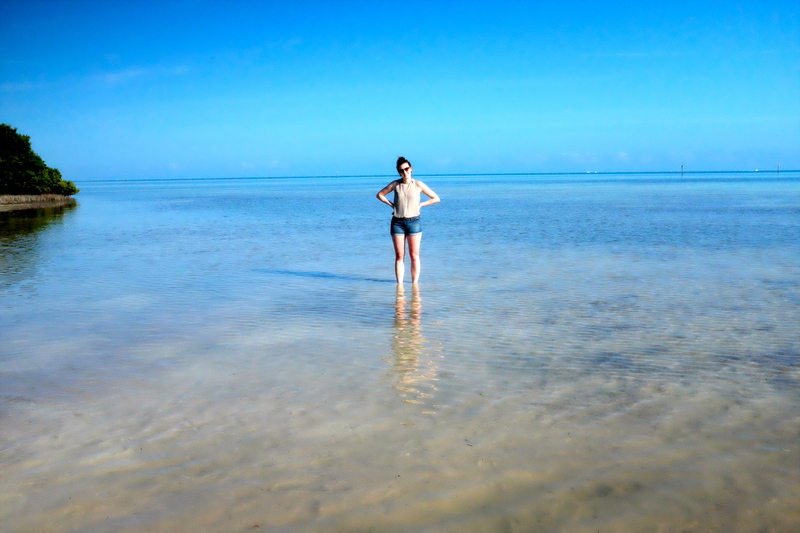 We didn’t make it all the way to the tip of the Keys, but we did stop to put our feet in the water on both sides of the highway. On one side was a mucky, bathtub-warm shallow beach that stretched languorously into the ocean. 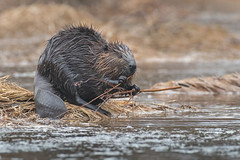 We probably could have walked for a kilometre and still only be wet up to our knees. The beach on the other side – more of a parking lot than a beach, really – was frigid and rocky. The blue water reached to touch the blue horizon on both sides of the highway. I could barely remember the grey-white reality of Canada. 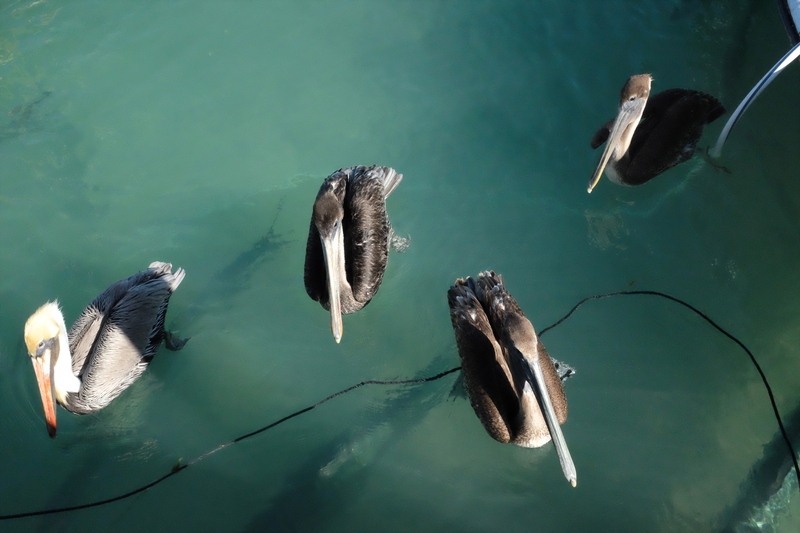 It struck me that perhaps the pelicans have the right idea. Up next: Dinner at Mai-Kai, the famous Polynesian restaurant in Fort Lauderdale.